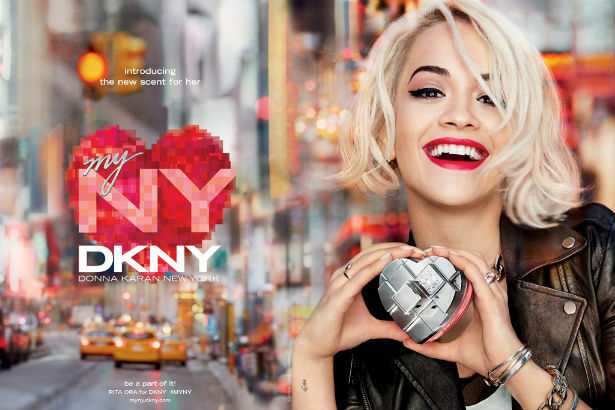 Donna Karan's releasing a new fragrance with a New York attitude, and she's tapping Rita Ora to help sell her scent. The "Never Let You Down" singer has a full plate: Over the next few months, she will be releasing five capsule collections for Adidas Originals, a project which already has the fashion set buzzing. But Ora found time in her busy schedule to take on this project for DKNY, for whom she's been an ambassador since 2013. Keeping true to Karan's New York-centric focus, the fragrance, called DKNY My NY is inspired by the city. The rose-hued scent is housed in a heart-shaped vessel with a skyline-inspired cap, running between $48 and $88 for 1-3.4oz bottles. The campaign, shot by Francesco Carrozzini, will drop at the time of the launch, with print ads appearing in glossies come August. “If Rita can’t sell it, I don’t know who can,” Karan said.